Making a Half-way House A Home! The original was just a front facade in that hole, the space inside - both upstairs and downstairs was empty inside. Between November 2013 and February 2014 I got an idea to expand into the chunk walls either side, the side near the icy ocean to become a kitchen diner, the other side being so massive I had to split it in two. These would become a storage room and nearer the entrance, the new living room. After a push on the kitchen diner I began working on the new living room. In this Google picture it had triangular windows above the door length windows, inspiring me to make a peak on the roof and do the same thus introducing a new higher roof that that of the chunk wall ceiling currently. *Ignore the trees I'm growing inside for Christmas. I've only just changed that closed off room (inside) Future bathroom) from temporary dirt walls to solid ones and added a four poster bed. The room is still bland but I hope to smarten it up like downstairs. I've since added the spruce wood to the roof and added black glass blocks for privacy. So big things are starting to change here in my home-away from home! I expect the bedroom will change dramatically if I get another inspiration. Nice house! Keep on updating! Not much difference you say? True, but notably smaller, and wait what's that in the last pictures - stairs?! Yep I went there, Originally I just created an alcove but after doing so I got the idea to build upstairs and add an extension up top. You'll see how it looks now, and from the outside too. There's also an extra lower space I found whilst digging but I am not sure what I am going to use that for. This is meant to be a home away from home from my main home-in-a mountain, but it's gone from a half-way house to a mini-mansion now! In other news I decided to do a big potion brew, I have lots of different mod drops stored up so decided to use some of them up, I created even more fire resistance potions, potions of poison,swiftness, strength and a couple of extra regeneration potions. After the big brew I was looking at my lab and how claustrophobic it is, and got a wild idea. Realizing the back wall doesn't back onto anything (Any other rooms/areas) I started extending back. Looks like as well as an extension, I could be getting anew lab design..
New walls with a feature back wall and 2x white-boards. Brand new floor using one of the new stone types. the ingredients lab (Spider eyes, glistening melons, flasks and water source) will also be extended back to match the new length of the main science lab. The new & improved Ingredients Lab will be come an area in it's own right with the new room length, It will now be a sterile room for handling featuring a small decontamination area between the entrance. (IE between two glass walls separating it from the other room. Quite excited for doing that, it's really needed I think compared to the current lab on page #1. I did contemplate a redstone testing area as well, backing onto the science lab but am not sure. However, that's not all! I'm contemplating completely re-developing the rear lounge that over looks the pool & tennis court. (Above the V.I.P. room), again from playing around on my creative copy of the world. Not matter how I try to re-furbish it, it either doesn't look right or is too similar to something I've done. Then I had a brief thought about turning it back to nature and leaving it as a hole as it was back in Alpha. However, what I might do is very radical. After playing around, I might - might make that a much bigger en- suite bathroom to what I have. Imagine that sized room as a bathroom! It's possible! The existing bathroom would become a new corridor, still leading to the V.I.P. room. The only problem I might have is not being able to have a working shower like I have now because of the space to hide the redstone, and; the ceiling being practically underneath the top of the mountain. So some possible new big projects, please leave me your thoughts and ideas. I sort of skipped out on a few of your updates, I'll go back through them later. This is all really great, and it's cool that you're still with it. I can't say that I've got much in the way of ideas for your coming builds. Do you have any sort of projects planned for the future? You can just direct me to go back a page or two if you've already stated the answer to this question. 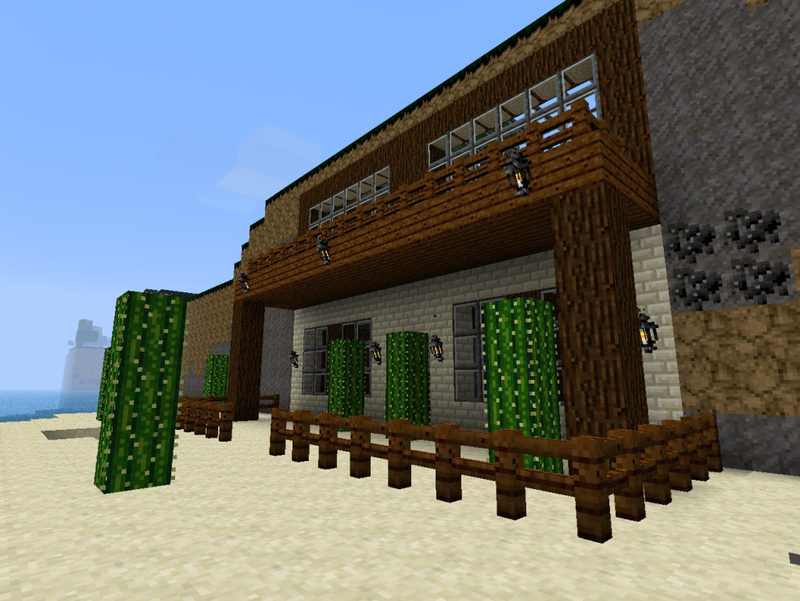 In 2012, my goals changed to improving builds (As my building style started to change), and generally make things look better on the outside and in. Following all the smaller jobs I had some bigger projects to do, most of which are either done, almost done or in progress. These including building a wall around Mount DOOOOoooom (Finished), Knocking down the bridge (Done, currently rebuilding) and improving the church (In progress) and building a minecart tunnel underneath the ocean (Done) as well as to the half-way house. Whilst there are still outstanding projects (Finishing interiors in the apartment block), you will no doubt see that new little projects are popping up all the time. As for bigger goals, it would be pretty being an old Alpha world to find a stronghold, however travelling to the middle of nowhere to defeat the Wither/Guardians in an Underwater Temple are still an option on the table. How big is the area/map that you've explored thus far? I've been trying to make an McMap, but with the world being 1.38gig the render was pretty big, I finally got it down to as smaller as I could but here's the explored area. Even this hasn't fully rendered properly though. Little bugger has a row & a quarter for speed! I've done this so over the Christmas time I can continue to travel to the mesa and get the red sand (= red sandstone = red sandstone stairs), I need for the church roof and continue that. With the bathroom now where the rear lounge was, I have also had to make the mountain top a block layer above what it was, to accommodate for the bathroom ceiling. Good job I'm using the Christmas version of my texture pack as you won't be able to tell where the change is, even then by the new year it will be grown over. (Already has.) I also demolished the wooden hut on top of the mountain as there is no longer access from there via the outside around the outside of the re-located bathroom. (Stairs to the outside of the mountain top could no longer be fitted in, this space has made bits of the bathroom wider.) It also means no stairs up from the lounge extension as well any more. The old wood fencing (before we cot new wood types) on top of the mountain have also been removed copying the brick-railings-hedges look further below. The change with the bathroom.rear lounge also marks two historical changes in that - when the bathroom was the rear lounge, it had the big glass wall windows looking onto the pool below in the near distance; as a reminder it was once a small cave. This is the first time this cave has ever been sealed over. The other being that the original bathroom was a dug-out extension in Beta, then a spare bedroom before they swapped. This new access corridor it's becoming marks a final end to the extension (2011 - 2014) as it is filled in on either side to make the new corridor. I am also looking for ideas for a chunk border near my home: Minecraft forum Link. With the third picture I decided to do away with the stairs from the back hallway down to the art gallery/library for good. Not because of the creeper, I could've just fixed it and that would be that. No, there's been an underlying problem for ages I've never addressed. That is, the illusion of the decor on the stairs down on the right hand side, is given by visible blocks for it on the library side, Now I could've just brought the library reception (With cured villager) forward a couple of blocks and hidden it with wall, but I would've lost landing space outside the reception desk. Other attempts in the past to hide it have not been successful. So as always, I don't just redecorate - I like to think of new alternative layouts I might not have originally thought of in [Alpha/Beta] and find a new way down to said art gallery & library. 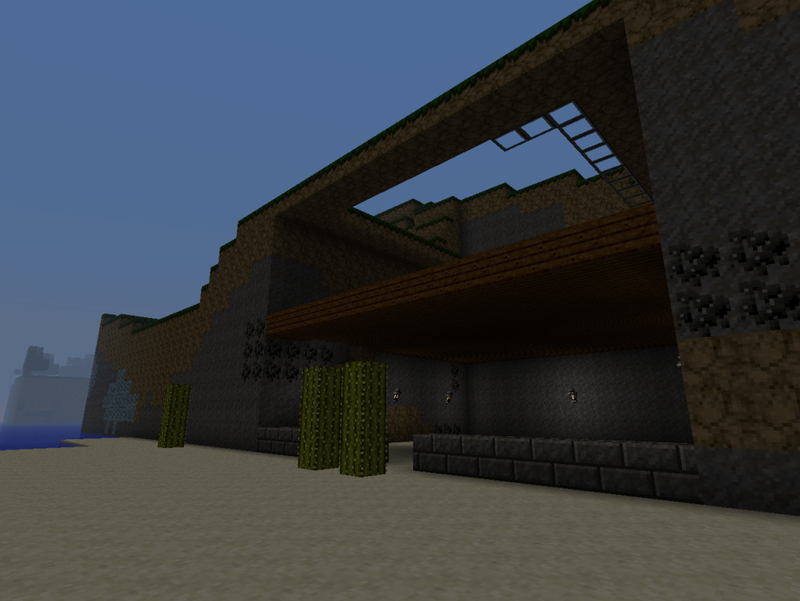 Most of it involved the secret entrance down to the snow factory/mob area/portal and those long cobble stairs (x2). After over an hour of no success, I found an alternative. It means no more secret entrance via pistons, but a door on the side of the wall behind the T.V. So the new reception with cured villager will be just inside on the right as you go in, underneath the end of the upper walkway in the extension. Needs decorating of course. I'll probably do up to the snow factory door and leave the rest. (Down to the mob area/portal.) There will also be double doors before the twisty stairs down also. Shame there's it's no longer "Secret entrance" via pistons, I've also had to take back the brick exterior walls that hid the redstone, so it looks more natural again. However, it's given that long boring 2x cobble stairs and walls down a new lease of life though in Tudor style and I like the new twisty turning stairs - better than 2x set of straight boring cobble stairs down with cobble walls. Really enjoyed viewing your work! Keep it up! Is there a world download? Not at the moment. I've thought about it many times but with the basics it's still a 1.28 gigabyte file, depends how people feel about that?.. With me not going back to work until Jan 5th and time to kill, I ended up starting the re-furbish of the science lab. I was going to wait until 2015 but like I said - time to kill. So far I had only dug out where the extension would be but I've been busy with it this afternoon. As of now the room has been been gutted. Still lots of new floors to lay yet. One more time, i've made my empire in minecraft, it's the 3rd time in a row I have one empire for each year, i've had one for 2012, one for 2013 and now, in the last week of 2014, but none of them my structures were really beautiful like your world! I did a little more to the lab and was just finishing up when I kept hearing this zombie inside near me, after also dealing with a skeleton I finally found him and it was a zombie villager! My current cured villager was pre-1.8, so this one would be a pure 1.8 villager! I lured him from outside the science storage area to storage where I had one cure pack left! (Potion of weakness + golden apple) that I made a week & half ago. After bombarding him I lured him down to the library and elevated myself on what ever blocks I had waiting for him to change! When he did I only went and got a library villager for my library! Did one trade, he also wants 22 emeralds for Lure III. Click the egg, any egg. Holy crap, a 4 year world? Better back it up regularly! I have a ~2 year world that I started in 1.2.5. Its small, but one of the only worlds I still have from a long time ago. Two and three would be the main problems, it's easy to get back into vanilla survival.